How do I connect between a master and a slave? How do I make an SPI slave? Please note: This is intended as a reference question. The Serial Peripheral Interface Bus (SPI) interface is used for communication between multiple devices over short distances, and at high speed. Typically there is a single "master" device, which initiates communications and supplies the clock which controls the data transfer rate. There can be one or more slaves. For more than one slave, each one has its own "slave select" signal, described later. 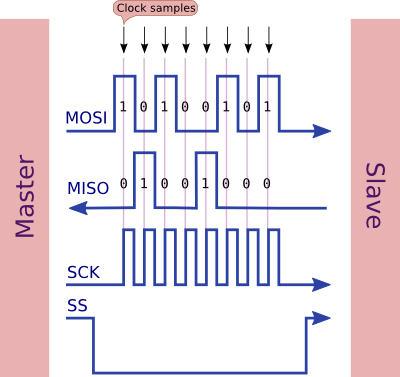 Slave Select (SS) - this tells a particular slave to go "active"
When multiple slaves are connected to the MISO signal they are expected to tri-state (keep at high impedance) that MISO line until they are selected by Slave Select being asserted. Normally Slave Select (SS) goes low to assert it. That is, it is active low. Once a particular slave is selected it should configure the MISO line as an output so it can send data to the master. Note that three signals are outputs from the master (MOSI, SCK, SS) and one is an input (MISO). Because data is sent and received on the same clock pulse it is not possible for the slave to respond to the master immediately. SPI protocols usually expect the master to request data on one transmission, and get a response on a subsequent one. The above code (which sends only) might be used to drive an output serial shift register. These are output-only devices, so we don't need to worry about any incoming data. In their case the SS pin might be called the "store" or "latch" pin. Most boards will follow a similar pattern. Sometimes DIN is just DI (Data In). This uses exactly the same signal names as the other board. In both of these cases you can see that the board only needs 5 wires to it, the three for SPI, plus power and ground. 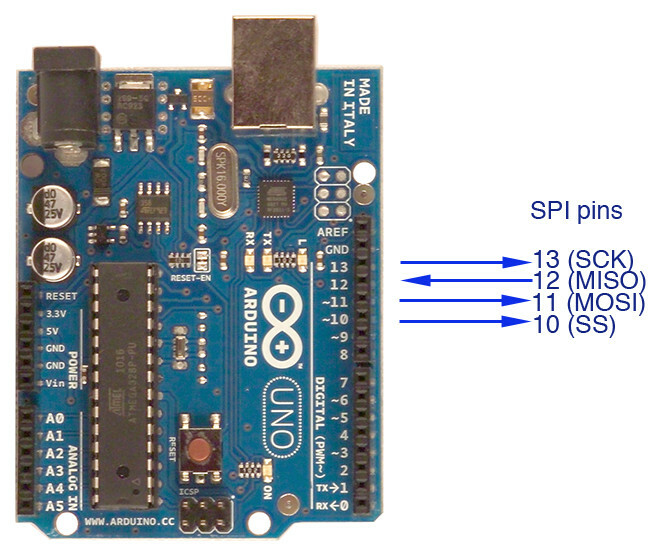 There are four way you can sample the SPI clock. 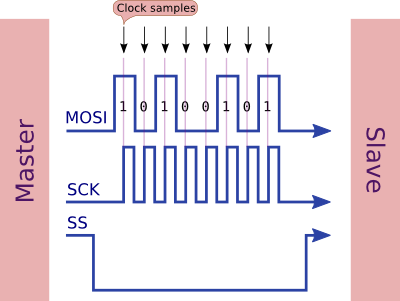 The SPI protocol allows for variations on the polarity of the clock pulses. CPOL is clock polarity, and CPHA is clock phase. As you can see the clock is normally low (CPOL = 0) and it is sampled on the leading edge (CPHA = 0) so this therefore is SPI mode 0. The fastest rate is "divide by 2" or one SPI clock pulse every 125 ns, assuming a 16 MHz CPU clock. This would therefore take 8 * 125 ns or 1 µs to transmit one byte. However empirical testing shows that it is necessary to have two clock pulses between bytes, so the maximum rate at which bytes can be clocked out is 1.125 µs each (with a clock divider of 2). To summarize, each byte can be sent at a maximum rate of one per 1.125 µs (with a 16 MHz clock) giving a theoretical maximum transfer rate of 1/1.125 µs, or 888,888 bytes per second (excluding overhead like setting SS low and so on). 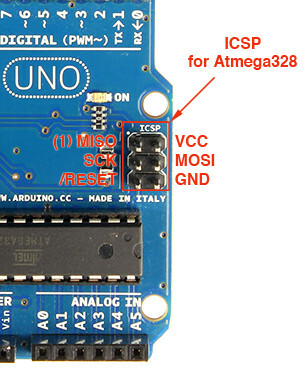 You can also use the ICSP header, similar to the Uno above. The Leonardo and Micro do not expose the SPI pins on the digital pins, unlike the Uno and Mega. 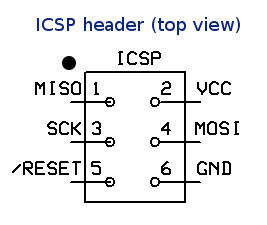 Your only option is to use the ICSP header pins, as illustrated above for the Uno. 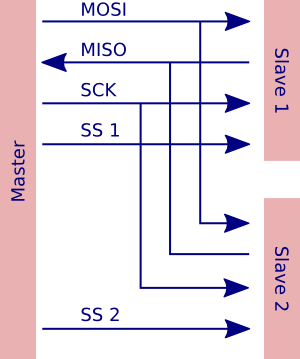 In this graphic you can see that MISO, MOSI, SCK are shared between both slaves, however each slave has its own SS (slave select) signal. The SPI spec does not specify protocols as such, so it is up to individual master/slave pairings to agree on what the data means. Whilst you can send and receive bytes simultaneously, the received byte cannot be a direct response to the sent byte (as they are being assembled simultaneously). So it would be more logical for one end to send a request (eg. 4 might mean "list the disk directory") and then do transfers (perhaps just sending zeros outwards) until it receives a complete response. The response might terminate with a newline, or 0x00 character. Read the datasheet for your slave device to see what protocol sequences it expects. The earlier example shows the Arduino as the master, sending data to a slave device. 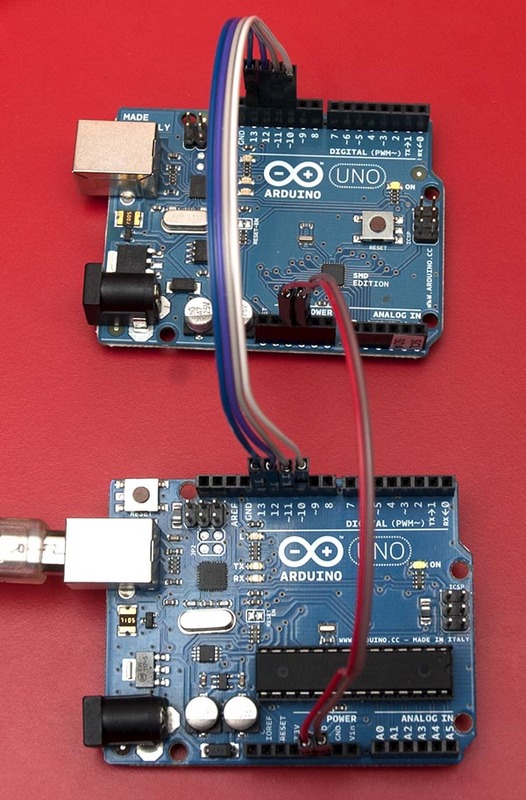 This example shows how the Arduino can be a slave. 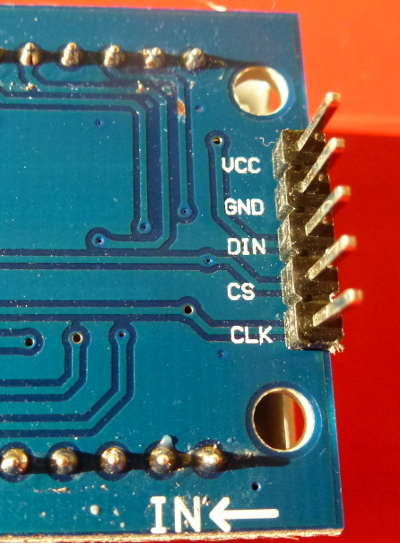 On the Arduino Mega, the pins are 50 (MISO), 51 (MOSI), 52 (SCK), and 53 (SS). In any case, MOSI at one end is connected to MOSI at the other, you don't swap them around (that is you do not have MOSI <-> MISO). The software configures one end of MOSI (master end) as an output, and the other end (slave end) as an input. The slave is entirely interrupt-driven, thus it can doing other stuff. The incoming SPI data is collected in a buffer, and a flag set when a "significant byte" (in this case a newline) arrives. This tells the slave to get on and start processing the data. Following on from the code above which sends data from an SPI master to a slave, the example below shows sending data to a slave, having it do something with it, and return a response. The master is similar to the example above. However an important point is that we need to add a slight delay (something like 20 microseconds). Otherwise the slave doesn't have a chance to react to the incoming data and do something with it. The example shows sending a "command". In this case "a" (add something) or "s" (subtract something). This is to show that the slave is actually doing something with the data. After asserting slave-select (SS) to initiate the transaction, the master sends the command, followed by any number of bytes, and then raises SS to terminate the transaction. First we request action on number 10. But we don't get a response until the next transfer (the one for 17). However "a" will be set to the reply to 10. Finally we end up sending a "dummy" number 0, to get the reply for 42. The code for the slave basically does almost everything in the interrupt routine (called when incoming SPI data arrives). It takes the incoming byte, and adds or subtracts as per the remembered "command byte". Note that the response will be "collected" next time through the loop. This is why the master has to send one final "dummy" transfer to get the final reply. In my example I am using the main loop to simply detect when SS goes high, and clear the saved command. That way, when SS is pulled low again for the next transaction, the first byte is considered the command byte. More reliably, this would be done with an interrupt. 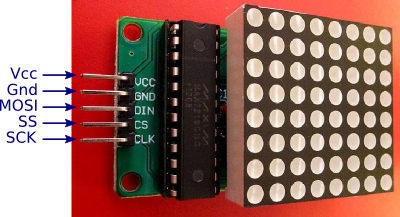 That is, you would physically connect SS to one of the interrupt inputs (eg, on the Uno, connect pin 10 (SS) to pin 2 (an interrupt input), or use a pin-change interrupt on pin 10. Then the interrupt could be used to notice when SS is being pulled low or high. I would add one preliminary question: when/why would you use SPI? A need for multi-master configuration or a very large number of slaves would tilt the scale toward I2C. Some devices (quite a few) only support the SPI transfer method. For example the 74HC595 output shift register, the 74HC165 input shift register, the MAX7219 LED driver, and quite a few LED strips that I have seen. So, you might use it because the target device only supports it. SPI is really the fastest method available on the Atmega328 (and similar) chips. The fastest rate quoted above is 888,888 bytes per second. Using I2C you can only get around 40,000 bytes per second. The overhead of the I2C is quite substantial, and if you are trying to interface really quickly, SPI is the preferred choice. Quite a few chip families (eg. MCP23017 and MCP23S17) actually support both I2C and SPI so you often can choose between speed, and the ability to have multiple devices on a single bus. The SPI and I2C devices are both supported in hardware on the Atmega328 so you could conceivably be doing a transfer via SPI simultaneously with I2C which would give you a speed boost. Both methods have their place. I2C lets you connect many devices to a single bus (two wires, plus ground) so it would be the preferred choice if you needed to interrogate a substantial number of devices, perhaps fairly infrequently. However the speed of SPI could be more relevant for situations where you need to output rapidly (eg. a LED strip) or input rapidly (eg. an ADC converter). My page about SPI - also has details about bit-banged SPI, and using the USART to gain a second hardware SPI on the Atmega328 chip. Not the answer you're looking for? Browse other questions tagged arduino-uno arduino-mega c++ arduino-leonardo spi or ask your own question. Sharing a Digital Pin / What to do when two components need a specific Digital Pin?